An important (and frequent) question we receive from builders and homeowners is, “What is the best way to insulate the roof of the house?” The short answer is: It depends on the roof design. We always add, however, that in almost every case– an Insulspan® SIP roof is the perfect solution. There are several reasons why this is true. Below are four of the benefits of a SIP roof. Roofs built with Insulspan SIPs combine the tedious labor of framing, sheathing, insulating, and the vapor barrier, into an ultra-quick, one step installation process. Think of the time savings. Consider this, a typical 3000-square-foot SIP roof panel package can take an experienced crew as little as two days to install! Hand framing, insulating, and installing vapor barrier for a 3000-square-foot vaulted ceiling takes…let’s just say we all know it takes a whole lot longer. 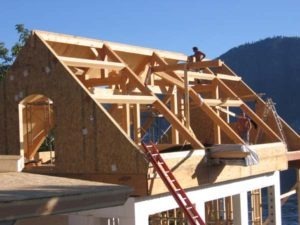 Regardless of what type of roof you build, i.e., flat roof, gable roof, shed roof, winged roof, gambrel roof, or even a roof with dormers, building it with SIPs saves time. In addition to saving construction time, an Insulspan SIP roof increases design options. Here’s how: SIP roof panels are not intended to be installed on top of standard trusses. Instead, they are intended to replace the trusses altogether in order to create design possibilities more commonly associated with a post and beam construction. In short, the panels cannot completely support themselves; they still need to be supported by beams or rafters of some sort. The result is open space. This resulting open space provides a lot of design options. It can be left as a vaulted ceiling above a great room. Or, the space allows for an added mezzanine level. It can even become an entire upper floor. In addition to the fact that your building now has this extra volume, you have the benefit of the aesthetic appeal of a cathedral ceiling. Then, of course, there’s the sustainability of SIP roof panels. EPS is recyclable; even the ‘off cut’ material from the manufacturing process can be returned to the EPS moulder for use in the manufacture of other EPS products. EPS provides long term thermal resistance; using EPS in SIP applications saves many times the energy embodied in the petroleum used to make EPS. OSB is manufactured from fast growing, carefully managed forests. OSB does not contain any urea-formaldehyde adhesives. The raw materials used to manufacture Insulspan SIPs are less taxing on the environment from a manufacturing standpoint. Additionally, building a SIP house requires less raw materials. For example, a SIP building typically uses about 30% less dimensional lumber. This is because studs are placed every 48”. Compare this to the standard 16” or 24” o.c. used in stick-frame construction, and you can easily see how crews use fewer raw materials. Another benefit of SIPs is that building with them drastically reduces job site waste. SIP roof panels arrive prefabricated and ready to install. This means no off-cuts, no insulation left overs, no plastic bags, and no scrap pieces of vapor barrier. 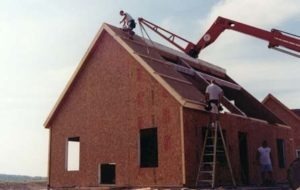 Not only does building your roof with SIPs save resources in production and minimize waste generation, it saves energy. The high R-value and airtight nature of the building envelope reduces the amount of gas and electricity used in heating and cooling the house. Even better? A Life Cycle Analysis (LCA) conducted by BASF comparing SIPs to conventional stick framing revealed that SIPs have a significantly lower impact on the environment. Not only does building a SIP roof save natural resources and energy, it also helps decrease carbon emissions. We call this a win-win-win!